Food systems reform is a critical area within the social economy. Concerns over food security in communities, the environmental effects of land cultivation, and a disconnect of people with their food are a few of the key issue areas that have driven communities to find sustainable ways to meet their economic, social as well as nutritional needs. This page outlines different reforms and alternatives in food production and distribution with useful resources for those wanting to know more and/or get more involved. The Sustainable Food Movement has an overview of what makes this method of agriculture beneficial, with a list of publications, video media and organizations that give further conceptual and practical insight. The Slow Food Movement provides background information on this culinary trend and the organization supporting it. Community Supported Agriculture gives links on effective involvement and databases on national and local CSAs. Farmers Markets is a great place for those wanting to locate active vendors. Urban Farms and Gardens has examples of on-going successful operations and troves of resources for practitioners as well as curious observers. Food Cooperatives is a helpful section for those wishing to start their own community store or are looking for the nearest one in their neighborhood. The majority of produce sold in America are products of an industrial farming system that mass produces food using inorganic fertilizers, artificial hormones, large tracts of irrigation and a fuel guzzling shipping network. Often, consumers are surrounded with unhealthy eating options and disconnected from their food source. Ecologically such farming and distribution practices exhaust fertile land and deplete large quantities of natural resources. The Sustainable Food Movement strives for environmentally conscious and socially responsible alternatives to generating and distributing produce. Farmers involved in the movement promote sustainable agriculture using methods such as crop rotation and contour building that maintains soil productivity and maximizes the use of organic resources. On the receiving end consumers are encouraged to buy locally, fostering relationships with their farmers and keeping capital circulating in the area. The goal is tighter communities and collective land stewardship that leads to nutritious food for all. Sustainable Table: an educational program created by GRACE Communications Foundation to promote local sustainable food and community development. Farm to Table: a blog collecting the freelance journalistic entries of farmers, consumers and restaurateurs, forming a unified voice for change in the current American food structure. Food Routes: a web program by Food Routes Network, a national non-profit organization that seeks to foster community based food systems. Nourish: an educational initiative by the non-profit organization WorldLink that uses media and public seminars to open discussion on sustainable food systems for schools and communities. Berry, W. (2009). Bringing It to the Table: On Farming and Food. Berkeley, CA: Counterpoint LLC. Kenner, R. & Pearlstein, E. (2009). Food, Inc. United States: Magnolia Pictures & Participant Media. A critique on industrial farming and American eating habits. Documentary investigating genetically engineered produce and its social and economic effect. The founder of Virtuous Bread explains the foundation behind the “Eat well. Do good.” attitude and the benefits such attitude brings to the participants. Alarmed about globalization’s sterilizing effect on taste, the consolidation of the food industry and the increase in environmentally harmful agriculture practices, Carlo Petrini in 1986 campaigned against the creation of a McDonalds near the historic Spanish Steps in Rome. Petrini’s ideas and actions inspired like-minded farmers, chefs and consumers across the globe to protect local gastronomies and promote sustainable cultivation. By illustrating the traditional tie between culture and cuisine, a strong emphasis is put not only on buying locally but growing in accordance to an area’s ecology as well. Slow Food International: a non-profit organization with an outline of the movement’s goals and principles. Every two years over 8000 farmers, cooks, fishermen, students, educators and food producers from around the world meet in Turin, Italy to discuss food, environment, biodiversity and local development. This meeting is called Terra Madre. With the growing awareness of consumption risks and interest in dietary health, a popular way for consumers to be assured of wholesome produce is investment in a CSA. A community-supported agriculture (CSA) is a social food network where consumers pledge financial support to fund a growing season and in return receive a share of the harvest. A strong bond of cooperation exists with growers and consumers sharing the risks and benefits of a cultivation operation. Farmers can focus more on stewarding the land, being backed by shareholder investments. Shareholders on the other hand have the advantage of knowing where their food comes from and how it is produced, with most CSA farms providing volunteer opportunities and farm visits. Built on trust and collaboration a CSA uses communal ties to strengthen local agriculture and produce nutritious food. For information on how specifically CSAs operate and how consumers can get involved click on the link to Local Harvest, an organization with a great conceptual overview and a database on active CSA farms nationally. Participation in a CSA provides communities a relationship with the farmer and the land, while farmers are pulled from the isolation of their labor. CSA’s can also act as educational tools where farmers teach their communities about the land, what it takes to produce vegetables from week to week and nutritious recipes for the produce they deliver. This publication will help the Spirit Lake Tribe and other tribal nation decide whether and how to implement community supported agriculture on reservations. Prescott College Community Supported Agriculture: crops are harvested from a cooperative network of farms providing shareholding members a diverse selection of produce and financial support for numerous farmers in the area. Love Grows Farm: a sustainable practices farm that uses Organic Certified fertilizer and has been featured in many popular media outlets such as Martha Stewart Living. Crooked Sky Farms: produce is Certified Naturally Grown in this Phoenix based CSA farm that also sells in farmers markets. Maya’s Farm: a small sustainable farm that provides high quality produce hand cut daily for subscribers. River Road Gardens: located near the Santa Catalina Foothills of Tucson, this small vegetable farm uses biodynamic agriculture avoiding artificial fertilizers, using herbs and minerals as compost and going by an astronomical planting calendar. Tucson Community Supported Agriculture: providing fresh produce to over 500 local families from a dozen organic and sustainable farms and ranches. **coming soon** Gila Farm Cooperative: an agricultural consortium managed and operated by farmers from all over the globe with years of organic cultivation experience. Despite the dominance of supermarkets and convenience stores the traditional commercial exchange between cultivators and buyers is still active today. Farmers markets are avenues for small local farmers to directly engage consumers, earning more profit with the absence of a retail middleman. Customers have more opportunities to purchase fresh organic produce and local economies benefit from wealth being retained in the community. Socially it is a way for residents to mingle in their neighborhoods and display the local flavor and culture to visitors. Arizona Community Farmers Markets: a great place to locate farmers markets with a member vendor directory, locator, market calendar and information on other non-affiliated markets. Simply put, urban agriculture is cultivation and husbandry activities within large municipal areas as opposed to rural plots outside of the city center. More unique is how these urban farms use a permacultural approach, interlocking ecological and biological principles to maximize natural systems to meet human needs in a sustainable manner. These sustainable food sources are increasingly proving to have the social benefit of providing underprivileged neighborhoods with a degree of food security and the economic effect of growing local businesses. Homeless Garden Project intertwines agriculture with social rehabilitation. By purchasing CSA shares and store products consumers are not only supporting local agriculture but also directly funding job training and employment programs for homeless individuals in Santa Cruz, CA. The People’s Grocery aims to use food systems to enrich the West Oakland area providing a food distribution program for those in financial hardship, a public greenhouse and nutritional education programs for the community. Open Green Map: Green Map System promotes inclusive participation in sustainable development, engaging hundreds of communities in 55 countries in mapmaking since 1995. Get involved and support this global movement! Follow the link below to see a map of Phoenix Metro area community gardens. Scottsdale Community Garden Club: Valley residents can come to this garden till their own plot, building relationships with fellow cultivators. Tolmachoff Farms: this Glendale family farm offers fresh produce and variety of events and activities. The Farm at South Mountain: just south of Southern and 32 St. in Phoenix this sustainable operation is open to the public with a beautiful patio restaurant and has amassed culinary awards. Desert Harvesters: for those who appreciate the flavors the Sonoran Desert, this non-profit organization works hard to provide the Tucson area with foods and medicines made from shade trees native to the area. Those interested in how to start sustainable farming operations and what to plant have a resource in Sustainable Farmer, with its tips on soil treatment and seasonal growing. With profiles on fellow farmers, DIY articles, and a catalog of recipes, the Urban Farm Magazine is a helpful guide for occasional and aspiring urban cultivators. A great place for information on livestock, tools and organic techniques, Hobby Farms is an active online community of agriculturalists of all persuasions. With print and digital publications, Edible Phoenix has tips on what&quot;s in season, great locations for groceries, and cuisine events happening in the city. Pick Your Own has a directory of nearby farms that allow buyers to choose their produce on the spot. There is also a helpful guide on how to can produce. Inspired by the Rochdale Cooperative back in 19th century England, there is a steadily growing trend of consumers taking more control over their produce and how it is distributed through food co-ops. A food cooperative is a communally owned grocery store where consumers buy shareholding membership. Stores are solely meant to meet the needs of members, not outside investors. Surveys of people from nearly 300 co-ops done by the news publication netWorks found that having low-price food options and advancing the local economy were the top concerns of consumers. Food co-ops allow members to receive discounts, ensure ethical business practices and reach out to the community with some stores opening their doors to non-members especially those in need. 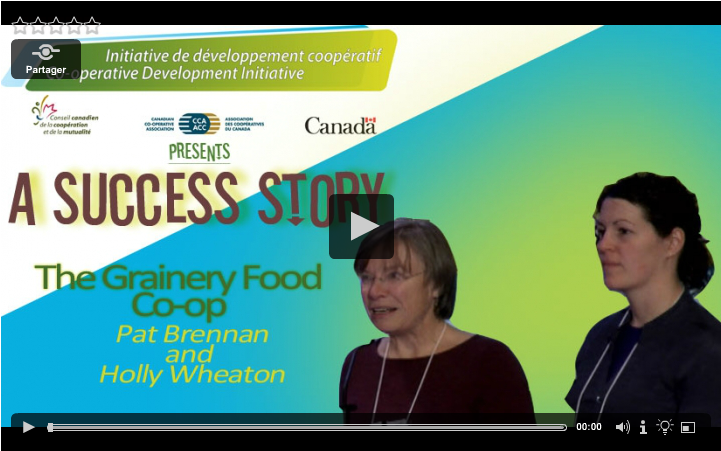 This video highlights The Grainery Food Co-op and their presentation at The Co-operative Development Initiative 2011 conference. They presented at the conference as a success story and spoke about their experiences starting and maintaining the co-op. Maya Luna: Community Inspired, Worker Run Restaurant & Catering Coop When a family-owned restaurant in San Francisco’s Mission District was on the verge of closing, a group of local residents turned it into a worker co-op. Video in Spanish with English subtitles. As San Francisco’s Mission District becomes a citywide destination, long time residents have paid the price. Rent have skyrocketed, long time mom and pop shops closed down their doors, leaving many long time residents on the verge of displacement. Tired of being pushed out of their community, everyday neighborhood heroes have emerged from the hardship and economic struggle to create an alternative solution. Through late night meetings, weekend skills shares, collective sharing of recipes and food traditions, along with a lot of passion and community will, the eight leaders made the decision to build a worker owned cooperative out of the struggling mom & pop business, Rosy’s Restaurant. The owner, Rosy Herrera, a 20 year entrepreneur and single mother of five, was on the verge of closing up shop and becoming another statistic. Instead, a new and powerful vision has emerged: one that builds community, creates meaningful employment, preserves traditions, puts decision making power in the hands of local residents, and serves as an inspiration to immigrant-led movements fighting displacement in their working class barrios. Food Conspiracy Co-op: Since 1971, Food Conspiracy has supplied the Tucson area with a cooperatively owned natural foods market. They are committed to natural and organic food products, environmentalism, education and social justice. Bountiful Basket: a grassroots volunteer operation where members based on location pool money to buy produce at discounts and later evenly distribute through baskets. The Cheeseboard since 1971 this collective has been worker owned providing various gourmet cheeses, pizzas, breads along with live music daily. The Fort Collins Food Co-op originally a buying club by CSU students, this store offers local and organic produce to non-members at monthly discounted prices reinforcing their “anyone can shop” ethic. Financial assistance can be found in the Food Co-op Initiative’s seed fund grants and loans.